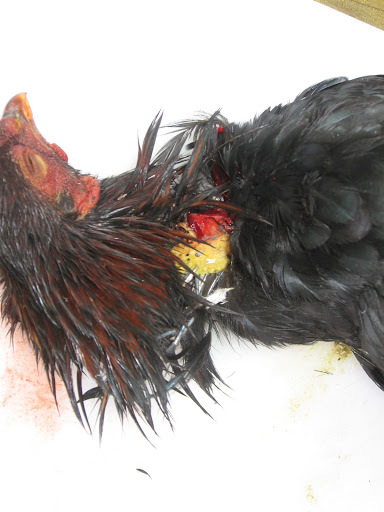 How to butcher/slaugher a chicken the "easy way"
1-Chickens go to sleep when their blood rushes to their head. Hang them upside down. We normally use what is called a “killing cone”, and most people make them themselves, but you can buy them if you wish. The cone cradles the bird, and prevents one horrible mess (see #2). 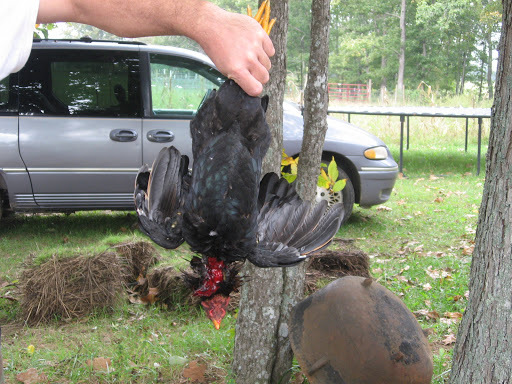 #2-Put the bird head down in the killing cone and grab a GOOD hold on it’s feet. The reason is, “like a chicken with it’s head cut off” means something. 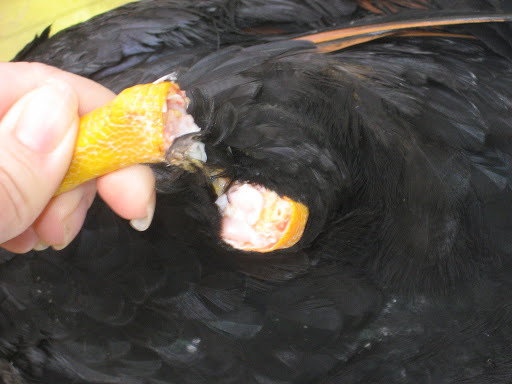 Chickens have this nerve thing where they jerk…hard…as they die. 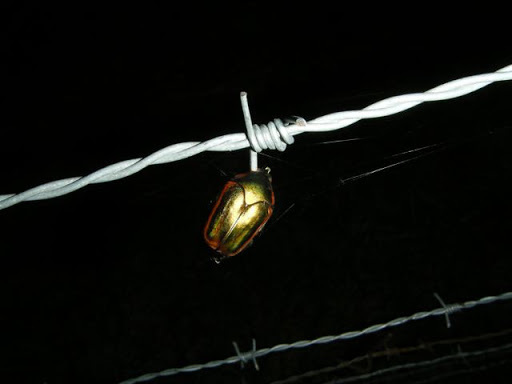 They’re usually dead before it’s over, and trust me, if it’s not in the killing cone, it ain’t pretty. Using someone else or your other hand, grab the head (gently) to stretch the neck and slice with a SHARP knife the main artery. We use Victorinox from Knife Works at Gatlinburg. (Let it drain into something to dispose of the blood) Below you can see we have done so already and have pulled him out of the cone. 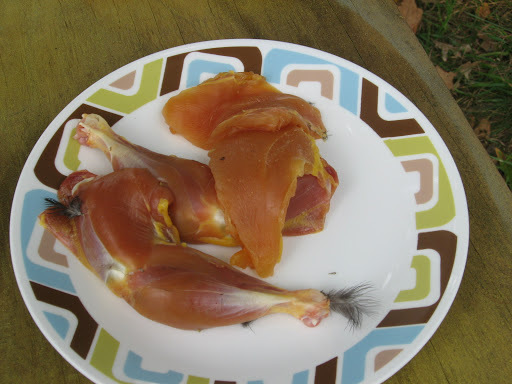 #3-Place said bird on the cutting board (we use an outside table with a clean board), and cut off it’s feet. 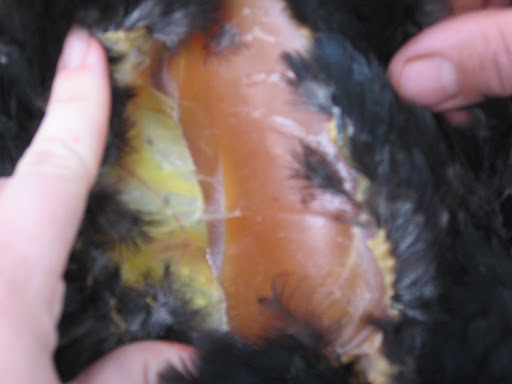 Below you can see the ligament area to place the knife. You need to bend the leg for this. Here you see a clean cut of just ligament BETWEEN the bone. Our knife will cut the bone, but it dulls the knife and potentially gives you chips in the meat. 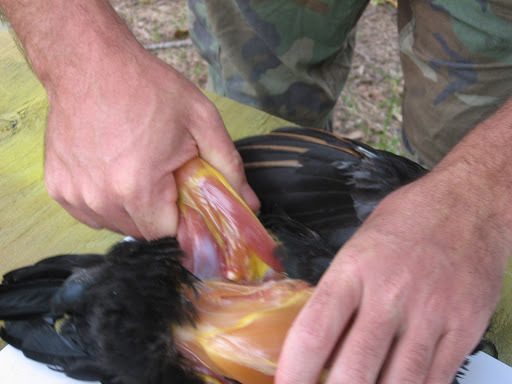 #5-Start going down the breast with the knife tip under the skin, and the blade aimed upwards. 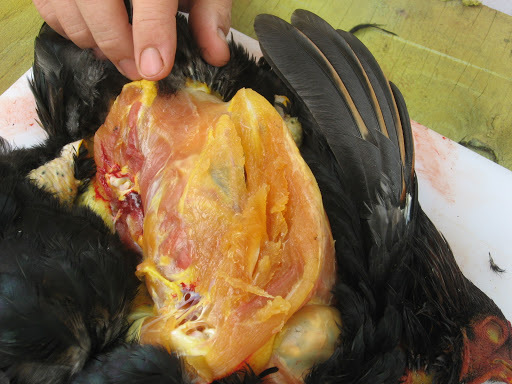 Cut the skin down to the bottom of the bird. 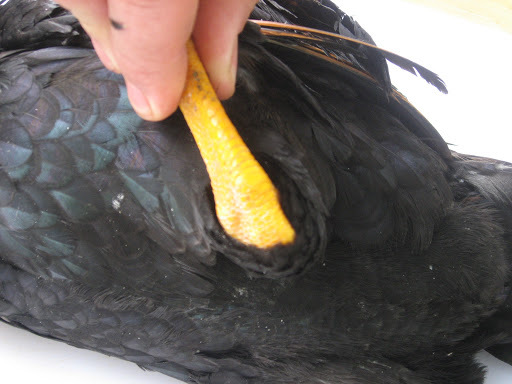 Step #8-Remove the leg and thigh. This part’s pretty gross for some people. 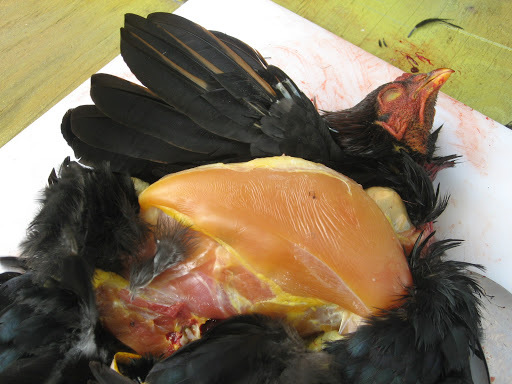 Break the joint, not the bone, of the thigh to the bird by pulling the leg sideways. 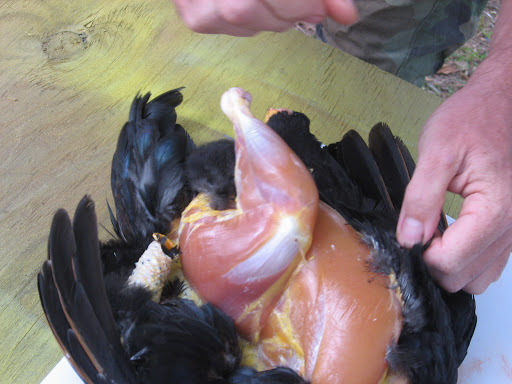 Cut the leg and thigh completely off. 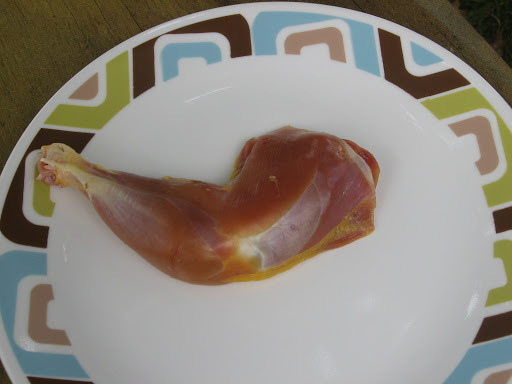 You can separate the leg from the thigh now by cutting between the bones, but we didn’t b/c this was a little bantam. 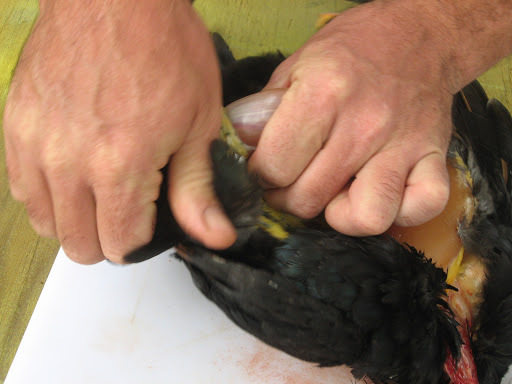 Step #9-You can easily cut the breast away from the bird now. 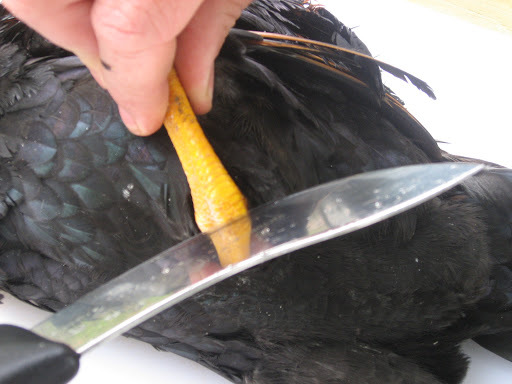 Run your knife along the bone and cut both sides off. I’m not good at this part and always leave some meat on. Now we are done. Yes, there are some feathers. Take it inside and wash it off with water. 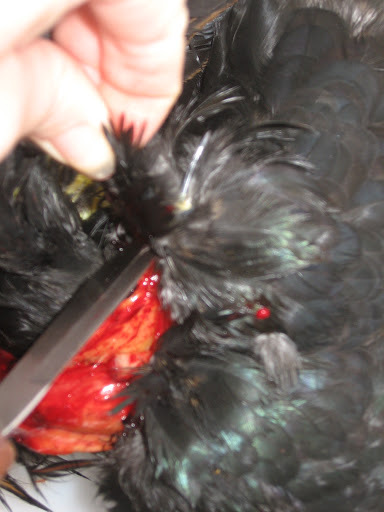 Trust me, there is no blood, and if you ever saw commercial chicken get butchered, you would NEVER eat it again. My way has no poop, has no need to starve the bird, has no need to grate your fingernails along the ribs to get all the lungs, and no need to spend all day plucking! Enjoy! We were on a field trip to Ripley’s Aquarium for homeschoolers day. 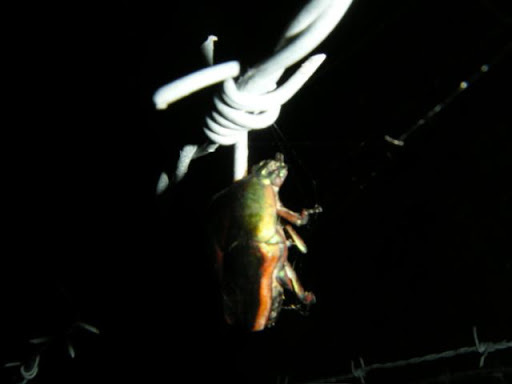 My dad took these pictures. 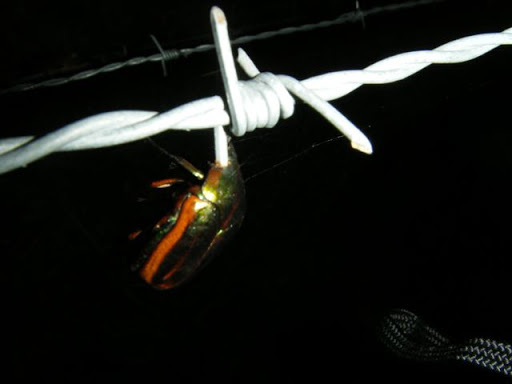 Apparently, this June bug was going real fast and had a broken radar. The Stockyard is where they auction livestock. 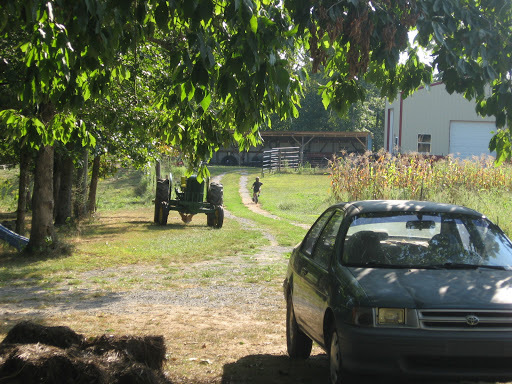 Sometimes called a salebarn. The one in Crossville is on Sat, the one in Cookeville on Tue, and there’s one on Mon somewhere I think. All during the day, obviously for people who do this for a living, and not your 8-5 worker (save maybe the one in Crossville). Now, I was never one to go to a sale barn, or cattle auction. I thought it was awful as the animals are usually from bad backgrounds: grain fed, you never know what you get, sometimes the fresh cows aren’t milked that morning so they look good and swollen so you’ll think they’re good milkers. BUT, Arlis mentioned the going rate and selling Marcus’s calf. So, we went to look at one, even though the calf sold beforehand, just to educate ourselves just in case. We get there about a half hour early so we can see what they have available. They had a catwalk that went over all the pens. It was pretty nice structurally speaking, although I will admit they could probably make more in selling spiders, spider webs, and dust than in commission. We go in and sit high up in the back so as not to be noticed by the auctioneer. Then they started auctioning off the animals. I’ve heard auctioneers before and knew I would have to learn to understand them, but this guy was just plain stupid in the way he delivered the prices. I don’t see how anyone understood most of what he said, although I did eventually figure out the going bid and what it sold for, and I think the buyer’s number. They had a TV screen with numbers all over it, and between my dad, husband, and myself, I think we understood about half of them. number of the sale (increased incrementally, starting at 1), ST (steer) HF (heifer-at least we think that’s what they were), number of the animal (they had little orange stickers attached to them), weight of the animal or average weight if sold as a group, selling price per 100 pounds, another number that was usually 42, 46 or so that we think may be the buyer’s number, and the total selling price. I’m sure you can see why it took us a while to figure it out. I don’t know how many cattle I bought that day. I truly hope none at all. I did see a woman give someone who worked there a paper she had written on, possibly her name and such. We never gave anyone any info, so I’m not sure how they know who bought it or not. 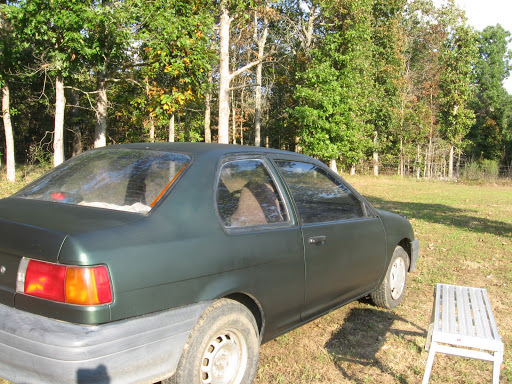 But we non-nonchalantly traversed to the little freshly painted Tercel, and went home…praying the whole time we did not inadvertently short change a seller. We never found out what a Holstein there would bring, but I did learn that people did not judge on much more than color. If it was black, they wanted it. Allow me to inform you, that just b/c it’s black, does not mean it’s Angus, and just b/c it’s Angus, does not mean it’s good. Angus is not the best meat around. I can tell you that too. But, that’s what the buyers wanted. 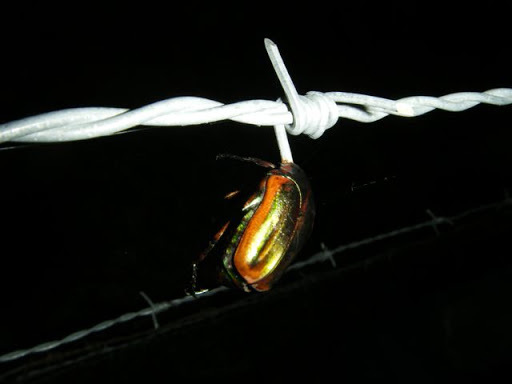 If it was black, it went for 115-125 per 100 pounds, but other colors went for less than 100 per 100 pounds. The steers also sold for more than the heifers. I had always thought heifers were worth more, but I guess these buyers were in it for meat only. I can tell you I’m never going to another one unless they have little bidding paddles or explain to me the rules…. We have a car. 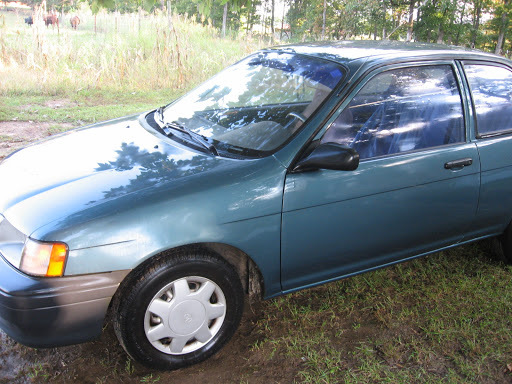 A 1994 Toyota Tercel with its original paint still on. The only way you’re prying it from me is to give me back my gen 1 RX-7 (with unlimited gas money), give me a genuine Delorian, or trade it for one of those snazzy Teslas. I get over 35 mpg on back roads and can zoom through just about anything. I laugh at shiny SUV’s with primpy women drivers and “manly” trucks with rednecks and other automobilic versions of silicon. 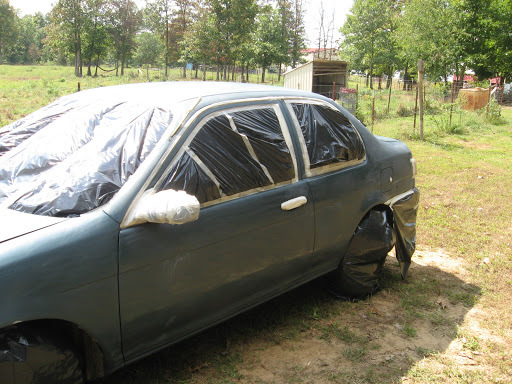 But, my car was in dire need of paint. Not for looks, for downright maintenance. 1-Get a car. It doesn’t have to be yours. I’m sure others would appreciate a good paint job for free. 2-Wash it up and make it real pretty like. Now, I know it’s hard to see in the pics, but below are the real barren spots. They were real obvious with the dirt on. Look for different colors in the paint. 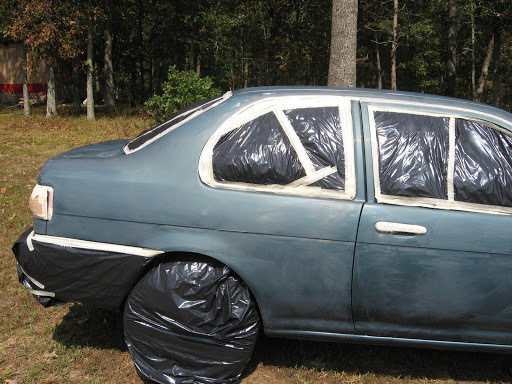 They were almost to the point of rusting, and we did have to sand out some rust areas, so we definitely needed to do this. 3-Sand it. We used 400 grit wet/dry sand paper with trickling water from our hose over wherever we sanded by hand. This took about 2 hours I guess with several breaks in between to let it dry so you can check for missed spots. You will want to wear nasty wet clothes for this as they will be wet and nasty by the time you are done with them. We hit bare metal in a few places, like edges,by accident, so be careful. 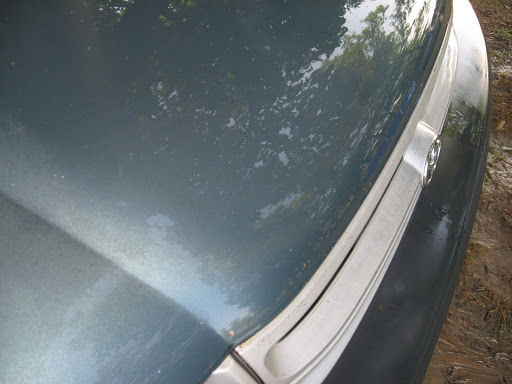 Sand out rust spots and fix body work (if needed-we did not need to) at this time. Rinse WELL and wipe with a microfiber cloth to get all the dust off. You want ALL shiny gone. 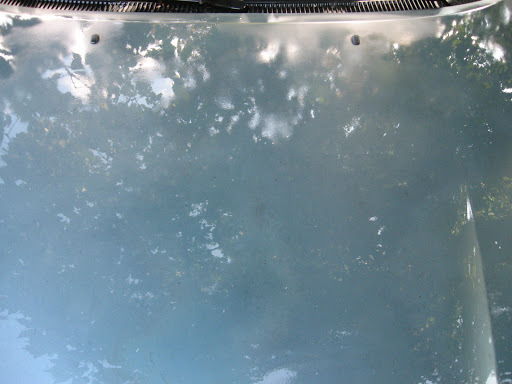 I thought there was no shine left on my car. There was. It will turn frosty (see tape pictures below). 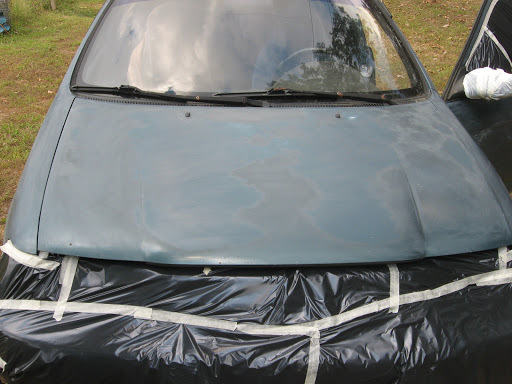 4-Tape it up-tape ANYTHING you don’t want paint on, and I mean anything. 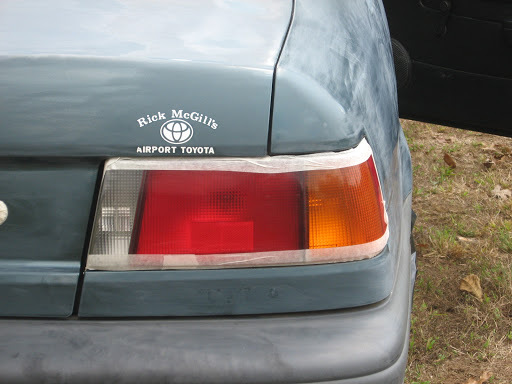 Start out with just tape around the edges for a real good trim job. Take off all your decals and anything removable (our included the antenna) that you don’t want painted. Then use grocery bags, trash bags, newspaper, or whatever you have. So- how much have you spent so far? Just the sandpaper right? And maybe 50 cents for the newspaper? Oh, and less than $10 for the tape. Go ahead and splurge on the tape. You do NOT want this coming off until you are ready. 5-paint. 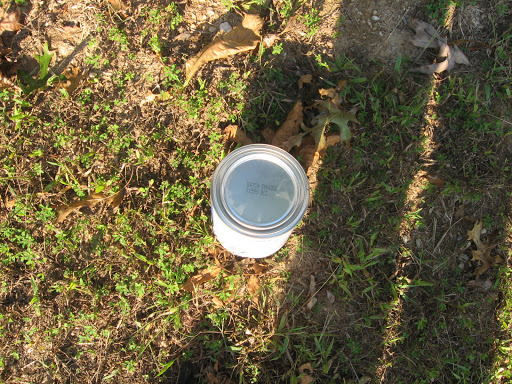 Buy the paint well ahead of time, and be sure all of this is done on a DRY and MILD day. 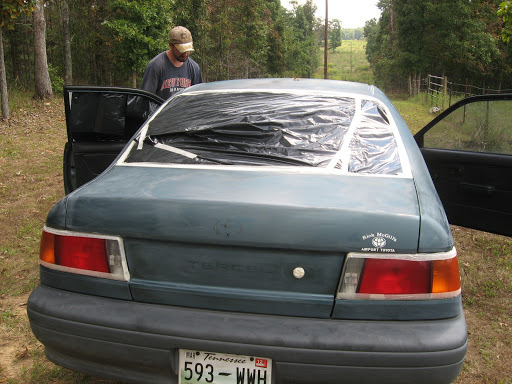 We used three quarts, but we had a pretty hard job needed on the car. 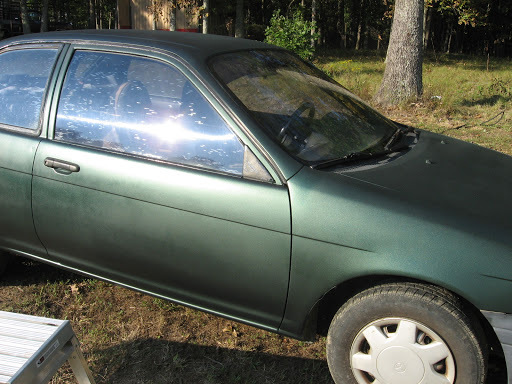 It was the metallic emerald green from Advance Auto. You could easily get it online for cheaper I’m sure. 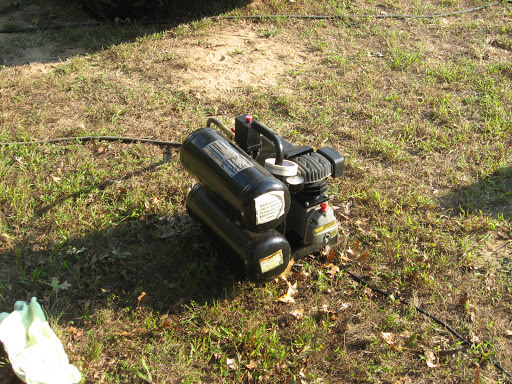 air compressor-I honestly don’t know how much these are. I’ve just always had one. Yours may already have a regulator with it. I suggest every house have one for cleaning and airing up tires. They’re handy as can be, and I would feel vulnerable without one. Therefore, I did not include it in the pricing. 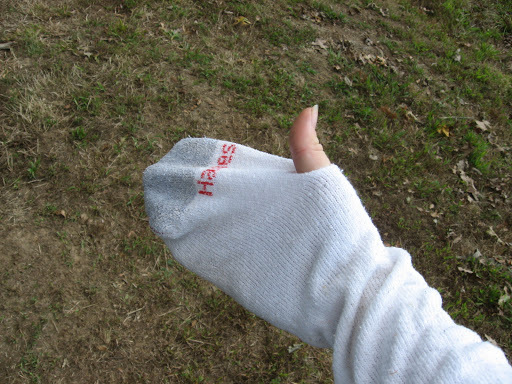 Gloves-I just knew I had gloves, but I didn’t. So, I made one with an old sock. It worked great! Oh, and the painter thingy. My dad bought this touch-up paint gun on sale at Harbor Freight for $18. Now, first of all, never buy from Harbor Freight. I have yet to get anything from that store that wasn’t made backwards or didn’t fall apart. But he did give it to us, so we don’t complain. In this instance, the canister screwed on backwards, the vertical/horizontal control was backwards, and there was no fill line. It also plopped out paint at the end leaving a few spots. 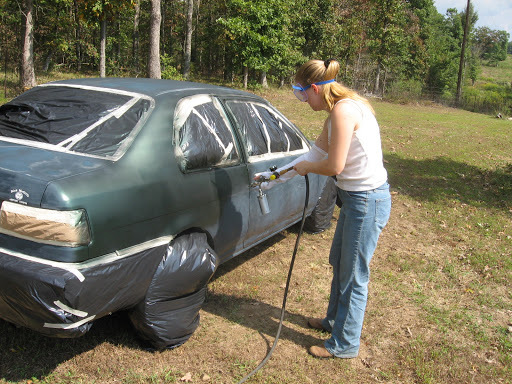 Secondly, a touch-up gun is not made to paint a whole car, and you will spend more time filling the canister than actually spraying paint. Thirdly, spray in an arc. Start spraying before you get to the car, sweep it over and away, and continue to spray as you swing back on your next swipe. That way, you get a gradual addition/removal of spray paint and less “steps” as my husband call them (points where you obviously started spraying). You will also want to do a final coat about 12-14 inches away as opposed to the normal 8 inches. This wastes a great deal of paint, but smooths it all out. Give 15 minutes between coats. Once you’re done, you’re done. You’ll have to sand again to paint another day, so do it all at once. 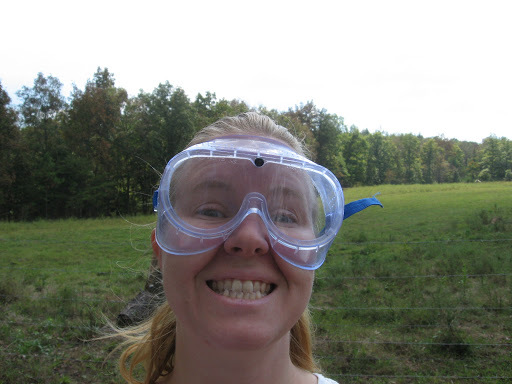 Clean up with the correct solvent, remove your tape and…. So, how much was it? About $130. If you bought a decent paint gun, it could still be under $200. 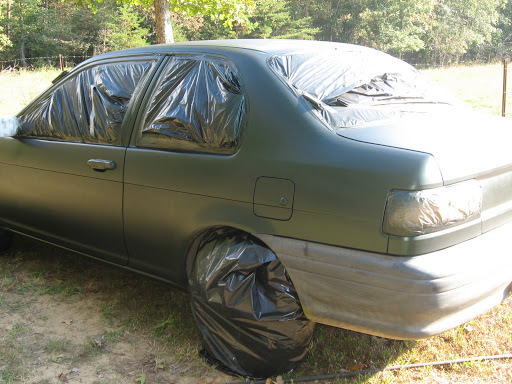 In fact, you would probably get cheaper paint than we did too, so that would really be a great price for the poor man’s paint job!!! PS-Be careful the hose doesn’t hit the car while you’re spraying, and be on the lookout for loose tape. You also want to angle your spray with the car-aka, spray up to get under the rims of things, and back to get in gullies, etc. DISCLAIMER: THIS IS FOR ENTERTAINMENT PURPOSES ONLY!!! DO NOT TRY THIS AT HOME!!! I recently got a kitten from the vet. It had conjunctivitis. The vet gave me antibiotics and steroids which did well up to a point. So, I looked for alternative means. PetWellbeing.com sold me a product called Eye Easy or EZ Eyes for feline and dog conjunctivitis. The other outdoor cat got it too, so we tried it on both cats for about a week each. I returned it and went to write a review about it only… Huh? What happened to all the reviews? They had removed EVERY bad review and it now had over four stars based on ten reviews. Also, it wouldn’t let me write a review. That’s odd. I waited several days and was able to write one today. But, I’m sure mine will find the other deleted ones and go live with them. DO NOT USE THIS PRODUCT, AND DO NOT SHOP FROM PETWELLBEING.COM!!!! !